In this study, we investigated AQP4 expression in injured astrocytes in vitro, as well as the influence of AQP4 levels on pathology using gene silencing. Astrocytes were cultured and the mechanical scratch method was used to simulate an injury. Cells were randomly divided into the control group, injury group, Scramble group (P-AQP4), and RNA interference group (siRNA-AQP4), and each group was divided into subgroups that were evaluated after 1, 3, 6, 12, 24, 48, and 72 h. Cell morphology and pathological changes were observed, and AQP4 protein abundance was measured. The morphology of the interference group was unchanged at 12 h, but cellular edema was significantly reduced at 24-72 h in comparison with the injury and Scramble groups. In interference group, AQP4 abundance was reduced after 1 h and reached its minimum level after 12 h, then increased to a peak level at 48 h, after which it declined from 48-72 h. With the exception of the 1 h time point, AQP4 protein levels in the interference group and the control group were significantly different throughout the observation period. In the interference group, AQP4 protein abundance decreased during the first 12 h of observation, increased from 24-48 h, then decreased at 72 h.
These results suggest that up-regulation of AQP4 in injured astrocytes mediates the delayed occurrence of edema in vitro, and AQP4 gene silencing effectively prevents edema in the mechanical scratch injury model. AQP4 down-regulation in astrocytes in the early stages of injury is likely a self-protective response. The total number of glial cells is about 50 times that of cerebral neurons, and astrocytes are the most important glia. Under physiological conditions, astrocytes nourish, protect, and repair neurons, but they are involved in the pathological processes of many diseases. Astrocyte-mediated cerebral edema is a pathological phenomenon that is common to conditions such as cerebral ischemia, cerebral hemorrhage, brain injury, and status epilepticus [1,2]. Therefore, the investigation of the molecular mechanisms of astrocyte-mediated cerebral edema is of significant clinical value . Aquaporin-4 (AQP4) is thought to play an important role in rapid transmembrane water diffusion in astrocytes [3-5], and it may also be involved in edematization in hypoxic glia . However, the effects of AQP4 mRNA silencing in astrocytes subjected to mechanical damage have not been reported. Therefore, we investigated the role of AQP4 in edematization of damaged glial cells and provide an important foundation for further study of the molecular mechanism of brain trauma. Wistar rats aged 0–2 days were provided by the Laboratory Animal Center of the West China Medical Center of Sichuan University. After the rats were decapitated, cortical tissue was harvested and immersed in Hank’s Balanced Salt Solution. The meninges and blood vessels were stripped from the tissue and cell suspensions were prepared. The filtrate was collected, transferred to 70 mL flasks, and cultured in a 5% CO2 incubator at 37 °C for 24 h. After the cells reached 80% confluence (12-14 d), they were digested with 0.25% trypsin, passaged, purified, and identified by GFAP. Third-generation cells were used in the experiments reported herein. Three pairs of shRNA sequences were designed based on the nucleotide sequences of AQP4 registered in the GenBank database (Gene ID: NM_012825). The sequences were synthesized by Shanghai GenePharma Co., Ltd. (Shanghai, China). Preliminary experiments were conducted to identify the most efficient shRNA sequences, which were used in subsequent experiments. The selected siRNA-AQP4 sequence was: (5′-GACAUUUGUUUGCAUUUCAAUUU UGAUUGCAAACAAAUGUCCA-3′). Double-stranded interference RNA sequences without significant homology to the human transcriptome (nonsense shRNA) was synthesized with the following sequence: 5′-AGUUCGGUCACUCAGUGA CAUUCAAGCAGUGAGU-3′. The culture medium was replaced 1 day before the transfection. The astrocyte concentration was adjusted to 2 × 105/mL and the cell suspensions were seeded in 6-well plates (2 mL per well). Liposomes-mediated transfection was performed using Lipofectamine 2000™ (Shanghai GenePharma Co., Ltd., Shanghai, China) according to the manufacturer’s instructions. Coverslips with marks on 2 corners at a 0.5cm interval were disinfected prior to use. Third-generation cells were used to prepare the cells that were grown on the coverslips. When the cells reached 80% confluence, model injuries were produced by dragging a 10 μL plastic pipette tip through them. The extent and scope of the model injuries were kept consistent across the samples. After the injury was produced, D-Hanks solution was added to remove cellular debris, after which complete medium was added and the cells were placed in a CO2 incubator. The coverslips were randomly assigned to 4 treatment groups: control (without treatment), injury, placebo (P-AQP4), and interference (siRNA-AQP4). Each group was further divided into 7 subgroups based on the incubation time that was allowed to pass before the cells were assayed (l, 3, 6, 12, 24, 48, and 72 h). The cells grown on coverslips were harvested at the appropriate time-points and fixed in 4% paraformaldehyde. Cells were stained by routine hematoxylin and eosin (H & E) staining, and photographed observed under an optical microscope and photographed. The cells were also subjected to lead-uranium double-staining. Nerve cells and organelle morphology, as well as the structure of the blood-brain barrier, were photographed under an EX-2000 transmission electron microscope. The cells and organelles were evaluated for the presence of edema. In vitro cultured astrocytes were soaked in hydrogen peroxide solution for 15 min. The cells were added to 100 μL of normal serum and incubated for 10 min, and then incubated with the AQP4 primary antibody (rabbit anti-rat, 1:200, Santa Cruz Biotechnology Inc., Santa Cruz, CA, USA) for 24 h at 4 °C. After the incubation, the cells were washed 3 times with PBS and incubated in the biotinylated secondary antibody (goat anti-rabbit, 1:200, Santa Cruz Biotechnology Inc., Santa Cruz, CA, USA), for 10 min. After rinsing with PBS, the samples were incubated with alkaline phosphatase labeled-streptavidin for 10 min, and rinsed again. An alkaline phosphatase chromogenic kit and DAB were used for coloration. The samples were counterstained with hematoxylin and sealed. An untreated negative control group was established simultaneously for comparison. The presence or absence of APQ4 expression was observed. The samples were homogenized under liquid nitrogen. Total protein was extracted using RIPA buffer, and the total protein concentration was measured by the BCA Protein Assay Kit (Beijing Mecomedia Bio-Tech. Co., Ltd. Beijing, China). SDS-PAGE (12%) was performed and proteins were transferred to a nitrocellulose membrane. The membrane was blocked in PBST blocking buffer containing 5% defatted milk at room temperature for 2 h. The membrane was incubated with the AQP4 primary antibody (rabbit anti-rat, 1:200, Santa Cruz Biotechnology, Santa Cruz, CA, USA) for 2 h at 37˚C. After the membrane was washed, it was incubated with the secondary antibody (goat anti-rabbit, 1:200, Santa Cruz Biotechnology, Santa Cruz, CA, USA) at 37˚C for 2 h. The membrane was washed, developed, exposed to film. The film was scanned and the target bands were analyzed using a Bio-Rad gel imaging system (Bio-Rad, Hercules, CA, USA). Data are expressed as mean ± standard deviation. SPSS 18.0 statistical software was used for analysis (IBM Corp., Armonk, NY, USA). Comparisons of means were performed using paired t-tests. A result of P<0.05 indicated statistical significance. In the subcultures of the third generation glial cells, GFAP was stained green and AQP4 was stained red. Representative images are shown in Figure 1. Figure 1: GFAP-AQP4 double-staining to identify glial cells (light microscope, 400X magnification). GFAP appears green, and AQP4 appears red. Imposition of the 2 images appears brownish red. Morphological changes in the cells were evaluated by immunocytochemical staining of AQP4. Pathological changes were evaluated by electron microscopy after H & E staining. Glial cells in the control group had normal morphology and did not undergo pathological changes. Changes in the injury and Scramble groups were similar. The morphology of AQP4-positive glial cells at 1, 3, 6, and 12 h after injury was not significantly different from that of the cells in the control group; however, at 24 h and 48 h after injury the injured glial cells were significantly more swollen than the control cells, and the swelling was only slightly alleviated after 72 h (Figure 2). The cells in the interference group had no significant morphological and pathological changes at 1, 3, 6, and 12 h after injury, but edema was significantly improved at 24, 48, and 72 h after injury (Figures 3 and 4). Figure 2: Morphological observations of the glial cells in the control group and the injury group (immunocytochemical staining, light microscope, 400X magnification). a: normal glial cells in the control group; b, c, d, e: glial cells without obvious swelling at 1, 3, 6, and 12 h after injury; f, g: enlarged glial cells with obvious swelling at 24 h and 48 h after injury; h: glial cells with alleviated swelling at 72 h after injury. Figure 3: Pathological changes in glial cells at 24 h in the experimental groups (hematoxylin and eosin staining, 200X magnification). a: control group; b: injury group; c: placebo group; d: interference group. Normal glial cells in the control group were observed under a light microscope. Glial cells with obvious swelling were observed in the injury and placebo groups. Glial cells with alleviated swelling were observed in the interference group. Figure 4: Morphologies of glial cells in the experimental groups at 24 h (scanning electron microscope, 6000X magnification). a: control group; b: injury group; c: placebo group; d: interference group. Normal glial cells were observed in the control group, apparent mitochondrial swelling was observed in the injury and placebo groups, and significantly alleviated mitochondrial swelling was observed in the interference group. Only a few cultured glial cells in the control group were AQP4-positive. 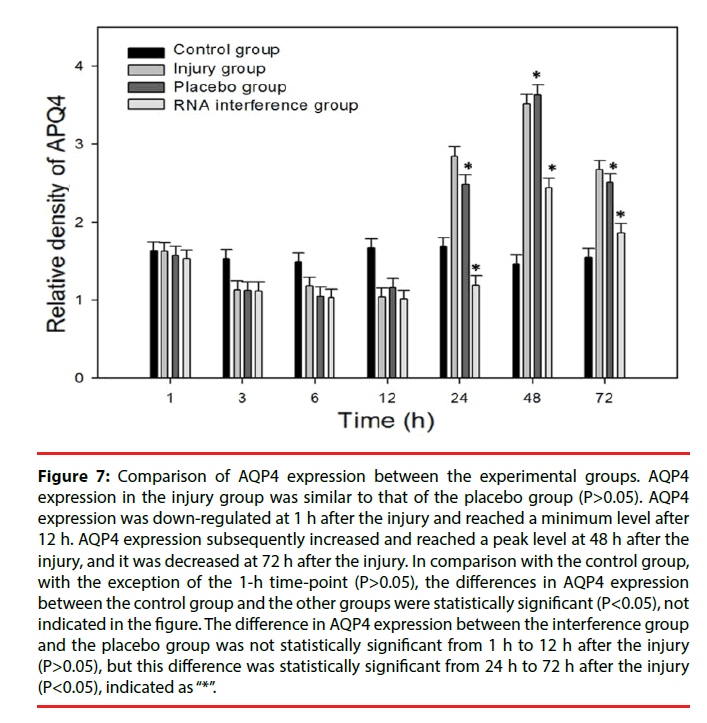 The results in the injury group and the Scramble group were similar: significantly fewer AQP4-positive cells were present at 1, 3, 6, and 12 h after injury, but the number of AQP4-positive cells was significantly increased at 24 h and 48 h after injury, and subsequently decreased after 72 h (Figure 5). The number of AQP4-positive cells in the interference group was not changed significantly at 1, 3, 6, and 12 h after injury, but the number of AQP4-positive cells was significantly decreased at 24, 48, and 72 h after injury (Figure 6). Results from the semi-quantitative analysis of AQP4 protein expression are shown in Figure 7. Figure 5: AQP4 expression in the injury group (immunocytochemical staining, 200x magnification). a: control group; b–g: injury groups (b, 3 h; c, 6 h; d, 12 h; e, 24 h; f, 48 h; g, 72 h). The number of AQP4-positive cells decreased after the injury and reached a minimum at 12 h after the injury, but this number was increased after 24 h and reached a maximum at 48 h, after which it was decreased at 72 h after the injury. Figure 6: Comparison of AQP4 expression between the interference group and the placebo group. There was no significant difference in the number of AQP4-positive cells (immunocytochemical staining, 200x magnification) between the (a) placebo group and (b) RNA interference group at 3 h after the injury. The number of AQP4-positive cells (immunocytochemical staining; 100X magnification) in the RNA interference group (b) was significantly decreased in comparison with that of the placebo group at 48 h after the injury. Figure 7: Comparison of AQP4 expression between the experimental groups. AQP4 expression in the injury group was similar to that of the placebo group (P>0.05). AQP4 expression was down-regulated at 1 h after the injury and reached a minimum level after 12 h. AQP4 expression subsequently increased and reached a peak level at 48 h after the injury, and it was decreased at 72 h after the injury. In comparison with the control group, with the exception of the 1-h time-point (P>0.05), the differences in AQP4 expression between the control group and the other groups were statistically significant (P<0.05), not indicated in the figure. The difference in AQP4 expression between the interference group and the placebo group was not statistically significant from 1 h to 12 h after the injury (P>0.05), but this difference was statistically significant from 24 h to 72 h after the injury (P<0.05), indicated as “*”. Cerebral edema is a major complication of brain injury that is associated with increased intracranial pressure and hernia formation. It has been estimated that 50% of deaths due to brain trauma were associated with brain edema and related complications . Traumatic brain edema includes the vasogenic cerebral edema and cytotoxic brain edema subtypes . Cytotoxic edema (intracellular edema) occurs mainly in the early stage of brain injury [9,10], and primarily affects astrocytes . Available therapeutic interventions against cytotoxic edema in astrocytes caused by mechanical injury are very limited and achieve poor results in most cases . AQP4 is the most highly expressed and most frequently investigated aquaporin in the brain [3,13], and it is involved in brain edema caused by ischemia, hypoxia, and contusion . However, the mechanisms through which AQP4 produces intracellular edema after traumatic brain injury are not well understood. In vitro cellular experiments eliminate the influence of many external factors that can interfere with the interpretation of basic mechanistic results, and studies of this type are instrumental in elucidating the function of AQP4 in the brain during the development of cellular edema . Therefore, in in vitro investigations of intracellular edema, astrocytes merit particular focus. In the present study, astrocyte injury was modeled in vitro and combined with RNA interference methods to reveal the mechanisms through which AQP4 influences brain edema. The present experiment found that AQP4 distribution and expression were stable in third-generation astrocytes. Furthermore, in the early stage of mechanical injury, AQP4 expression was stable in cells without obvious morphological changes. This result confirms that AQP4 expressed on astrocyte cell membranes plays an important role in the maintenance of normal cell morphology and function . In this study, astrocyte-mediated cerebral edema primarily occurred 24-48 h after mechanical injury, but not within 1-12 h, which corroborated previously reported results. Furthermore, we found that obvious swelling occurred in the early stage of mechanical injury (2-24 h) . These results indicated that the influence of a variety of factors, including vasogenic edema, various cytokines such as ONS, MAPKs, and mPT, and the external environment, could be excluded [14-16]. Astrocyte morphology and function are mainly determined by membrane proteins and the intracellular environment. In addition, during the early stage of mechanical injury, AQP4 expression in astrocyte membranes in the injury group declined continuously, but mildly, indicating that decreased AQP4 protein expression was not significantly correlated with the worsening of intracellular edema in astrocytes after injury, and that this change in expression was probably a self-protection mechanism for the cells [17,18]. AQP4 expression was rapidly increased from 24-48 h after mechanical injury, while cell swelling appeared and was significantly aggravated. AQP4 was down-regulated 72 h after injury, and intracellular edema was also improved. These results suggested that changes in AQP4 expression in astrocyte cell membrane might be a direct mediator of changes in cellular edema. Comprehensive semi-quantitative analysis of the expression and distribution of AQP4 using immunohistochemical staining and western blot assays showed that AQP4 protein expression in astrocyte membranes began to decrease at 1 h, and reached a minimum level 12 h after mechanical injury. After the 12 h time-point, AQP4 expression quickly increased to a peak level at 48 h, and then gradually decreased until the 72 h measurement. The markers for the development, aggravation, and alleviation of intracellular edema after injury that were observed under the electron microscope showed a time-course consistent with that of AQP4 variation. Thus, it was demonstrated that changes in AQP4 protein expression had a causal relationship with brain edematization in astrocytes after mechanical injury. This finding suggests that inhibition of AQP4 expression may be an effective way to prevent intracellular edema mediated by astrocytes after mechanical injury. siRNA is a specific and highly effective method for inhibiting a target protein that has been widely utilized in the study of AQP4 gene function [5,17,19]. In the present study, AQP4 gene silencing in the astrocyte-mediated cerebral edema model was achieved using siRNA. The mechanisms through which AQP4 influences cellular edema in astrocytes after mechanical injury were investigated. We found that AQP4 protein in astrocytes 1-12 h after mechanical injury was decreased slightly in the interference group in comparison with the injury group, but this difference was not statistically significant. No differences in the extent of cellular edema between the interference group, injury group, and control group were identified by electron microscopy. This result showed that AQP4 expression was not induced as a stress response in the early stage of mechanical injury; instead, AQP4 expression was found to change slowly and continuously. Because siRNA functions mainly by inhibiting the synthesis of target proteins rather than inducing their degradation , the regulation of AQP4 protein levels in the cell membrane and the development of cellular edema in the interference group were also delayed. However, in the following 12–48 h, AQP4 protein expression in the injury group increased rapidly. Immunofluorescence showed that AQP4 expression in the astrocyte cell membrane increased continuously from 12-48 h after injury. This sustained increase in expression may be have been caused by differences in intracellular and extracellular osmotic pressure caused by disordered self-protection mechanisms in the early stage of injury, as well as changes in extracellular ion concentrations , which induced AQP4 overexpression in the cell membrane. After AQP4 inhibition by siRNA, AQP4 protein expression was significantly reduced in the interference group at 24 h and 48 h (by 58.2% and 30.6%, respectively) after injury in comparison with that of the injury group (P<0.05). In addition, the extent of astrocytemediated cerebral edema was found to be significantly alleviated via electron microscopy. These findings further confirmed the key role of AQP4 in the edematization of astrocytes after mechanical injury. siRNA-AQP4 was shown to be an effective treatment for cellular edema after injury. In addition, empty vector RNA was used as a control treatment in the Scramble group. The results of the Scramble group experiments showed that AQP4 expression was not inhibited and that intracellular edema was not alleviated, suggesting that siRNA treatment was highly specific. In the present study, we found that after mechanical injury of astrocytes, AQP4 protein expression in the cell membrane first declines and then rises, showing a V-shaped curve. Up-regulation of AQP4 protein expression in the cell membrane is the direct cause of glial cell edema, and AQP4 down-regulation in the early stage of injury may be a protective response by the cell. siRNA interference specifically and effectively inhibited AQP4 expression and relieved edema in glial cells. The present study provides experimental evidence that supports the further development of gene therapies for traumatic brain edema. This project was supported by the National Natural Science Foundation of China (No. 81160181), the Haikou Municipal Key Project (No. 2015030), and the Chongqing Municipal Commission of Health and Family Planning Key Project (No.2016ZDXM04). Nicchia GP, Srinivas M, Li W, et al. New possible roles for aquaporin-4 in astrocytes: cell cytoskeleton and functional relationship with connexin43. FASEB. J 19(12), 1674-1676 (2005). Stokum JA, Kurland DB, Gerzanich V, et al. Mechanisms of Astrocyte-Mediated Cerebral Edema. Neurochem. Res 40(2), 317-328 (2014). Nagelhus EA, Ottersen OP. Physiological roles of aquaporin-4 in brain . Physiol. Rev 93(4), 1543-1562 (2013). Haj-Yasein NN, Vindedal GF, Eilert-Olsen M, et al. Glial-conditional deletion of aquaporin-4 (Aqp4) reduces blood-brain water uptake and confers barrier function on perivascular astrocyte endfeet. Proc. Natl. Acad. Sci. USA 108(43), 17815–17820 (2011). Nicchia GP, Frigeri A, Liuzzi GM, et al. Inhibition of aquaporin-4 expression in astrocytes by RNAi determines alterations in cell morphology, growth, and water transport and induces changes in ischemia related genes. FASEB. J 17(11), 1508-1510 (2003). Hong Lu, Hui Hu, Zhanping He. The effects of CoCl2-induced in vitro hypoxia on aquaporin-4 expression in cultured astrocytes. Chin. J. Neurol44(2), 117-121 (2011). Marmarou A. Pathophysiology of traumatic brain edema: Current concepts. Acta. Neurochir 86(1), 07-10 (2003). Unterberg AW, Stroop R, Thomale UW, et al. Characterization of brain edema following “controlled cortical impact injury” in rats. Acta. Neurochir. Suppl 70(1), 106-108 (1997). Unterberg AW, Stover J, Kress B, Kiening KL. Edema and brain trauma. Neuroscience 129(4), 1019-1027 (2004). BarzóP, Marmarou A, Fatouros P, et al. Contribution of vasogenic and cellular edema to traumatic brain swelling measured by diffusion-weighted imaging. J. Neurosurg 87(6), 900-907 (1997). Kimelberg HK. Current concepts of brain edema: review of laboratory investigations. J. Neurosurg83(6), 1051-1059 (1995). Marmarou A. A review of progress in understanding the pathophysiology and treatment of brain edema. Neurosurg. Focus 22(5), 1-10 (2007). Badaut J, Fukuda AM, Jullienne A, et al. Aquaporin and brain diseases. Biochim. Biophys. Acta 1840(5), 1554-1565 (2014). Lu H, Lei XY, Hu H, et al. Relationship between AQP4 expression and structural damage to the blood-brain barrier at early stages of traumatic brain injury in rats . Chin. Med. J 126(22), 4316-4321 (2013). Jayakumar AR, Panickar KS, Murthy ChR, et al. Oxidative stress and mitogen-activated protein kinase phosphorylation mediate ammonia-induced cell swelling and glutamate uptake inhibition in cultured astrocytes.J. Neurosci 26(18), 4774-4784 (2006). MacGregor DG, Avshalumov MV, Rice ME. Brain edema induced by in vitro ischemia: causal factors and neuroprotection. J. Neurochem 85(6), 1402-1411 (2003). Ren Z, Iliff JJ, Yang L, et al. “Hit & Run” model of closed-skull traumatic brain injury (TBI) reveals complex patterns of post-traumatic AQP4 dysregulation. J. Cereb. Blood. Flow. Metab33(6), 834–845 (2013). Shenaq M, Kassem H, Peng C, et al. Neuronal damage and functional deﬁcits are ameliorated by inhibition of aquaporin and HIF1alpha after traumatic brain injury (TBI). J. Neurol. Sci 323(1-2), 134–140 (2012). Badaut J, Ashwal S, Adami A, et al. Brain water mobility decreases after astrocytic aquaporin-4 inhibition using RNA interference. J. Cereb. Blood. Flow. Metab 31(3), 819–831 (2011). Elbashir SM, Harborth J, Lendeckel W, et al. Duplexes of 21-nucleotide RNAs mediate RNA interference in cultured mammalian cells. Nature 411(6836), 494–498 (2001). Marmarou CR, Liang X, Abidi NH, et al. Selective vasopressin-1a receptor antagonist prevents brain edema, reduces astrocytic cell swelling and GFAP, V1aR and AQP4 expression after focal traumatic brain injury. Brain Res 1581(1), 89-102 (2014).